I kept seeing this book everywhere. I wasn't initially intrigued because I had a hard time associating the author of Anna and the French Kiss with a murder mystery. I'm glad I ignored that part of my brain and decided to read this. It was gruesome, more so than I had originally thought it would be, and there were plenty of twists and turns that kept me guessing. I love it when I'm unable to figure out a book before it's conclusion. I was expecting to learn who the perpetrator was at the end, but Stephanie Perkins surprised me by identifying them in the middle. Their motives were still unknown, and it made the idea even scarier than before. Is it worse not knowing the face of the murderer, or to have known them all your life? Which would you find more disturbing? I would also like to point out that the adults in this book, with the exception of Makani's grandmother and Ollie's brother, were infuriating. If there is someone in your town, or even close by for that matter, murdering children/students, why in the hell would you ever leave your child alone? It doesn't make any sense. I would never risk leaving my children unattended in that situation, and honestly, I probably would have left town until the issue was resolved. I would not fly to Vegas for some adult time. 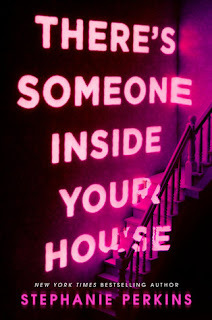 There's Someone Inside Your House didn't make me want to cry in a corner, but it did make me uncomfortable reading it alone at night. I am still on the fence about reading this one. I loved Perkins sweet and fluffy books, so I really wanted to read this, but reviews are all over the place. Glad you are on the positive side, because I think I am leaning towards reading it. Great review! You should! Just don't go into it thinking it's going to be like her other books. Read it without any expectations, and I think you'll really enjoy it! I’m excited to read this one because it’s so different from her other books. Glad to hear it’s suspenseful and exciting. Yes! While I adored Anna and the French Kiss, this book isn't anything like it. It's not light and fluffy, but dark and sinister. It makes you think twice about staying home alone, lol. Me too! If it's someone you know, it's personal. They already know things about you, which makes it, like you said, super creepy. Right? Who would leave their children alone with a crazy murderer in town?? It made no sense! I've read so many mixed reviews for this book. I think the mixed reviews are because people are comparing it to her other books, which isn't fair. I thought it was great. A dark, spooky read. Thank you! Jacob had tried to sit in my lap, but ended up knocking me out of the booth! The guy in charge of it tried to help me back in, and the damn thing kept taking pictures of us. I had the audiobook too (which I'm happy about)! Wasn't it weird that the perp was named in the middle? It was a risky move but I would have preferred more time to guess and speculate on who the killer was. That's usually how I feel, but I thought this had an interesting twist! I still wasn't sure of the motives, so that kept me guessing until the end.